The VT‑4 is the latest version of Roland's popular Vocal Transformer line, designed to give you all manner of popular vocal effects in a handy and inexpensive desktop box. The original VT-1 was a Boss product first released in the later half of the 1990s. The last version, the VT‑3, was reviewed in Sound On Sound in May 2014 by Paul Nagle. Back then, Paul praised the VT‑3 for its versatility, but noted that the pitch correction had reliability issues. Let's see what the latest incarnation has to offer. The VT‑4 is a similar format to its predecessor. At 174 x 133 x 58mm, it's slightly smaller, but maintains the four faders for principal controls, plus the large knob in the middle. The green livery of the Aria range is present, but much more subtly than in the VT‑3, being confined to the LED‑backlit buttons. On the VT‑4's back panel we find a power switch, a USB port, a MIDI input, a 'combi' jack/XLR socket and a pair of quarter-inch audio outputs.There's no traditional power supply socket; power comes via the USB 2 port or via four AA batteries if portability is required. 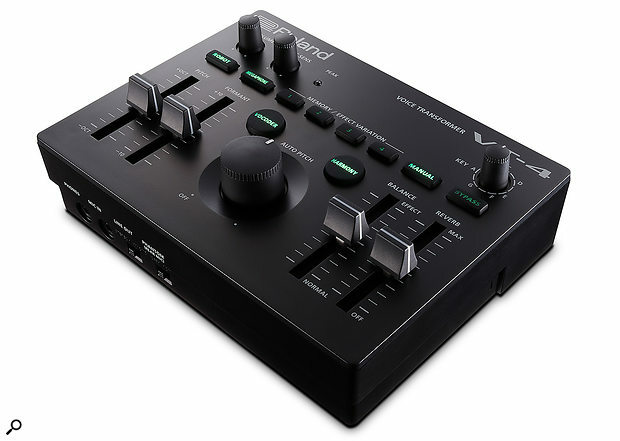 The USB port also allows the VT‑4 to be used as a USB audio interface — not class‑compliant, sadly; drivers are required. Around the back is a 'combi' XLR/TRS input with optional phantom power for your microphone, and a stereo pair of line outputs. There's also a MIDI input port, more on that shortly. On the front of the unit we find a 3.5mm headphone output and another microphone input. This input is to be used with more inexpensive plug‑in‑power compatible microphones. You'll also find switches for mono/stereo output and a phantom power switch for the rear XLR input.